A polar bear invasion of villages on the Novaya Zemlya Archipelago is being caused by climate change, namely reductions in sea ice, and the behavior of people who neglect proper waste management, said Mikhail Stishov, coordinator of Arctic biodiversity projects at the World Wildlife Fund (WWF). On Saturday, the Arkhangelsk Region government declared a state of emergency on Novaya Zemlya over the appearance of dozens of polar bears near human settlements. 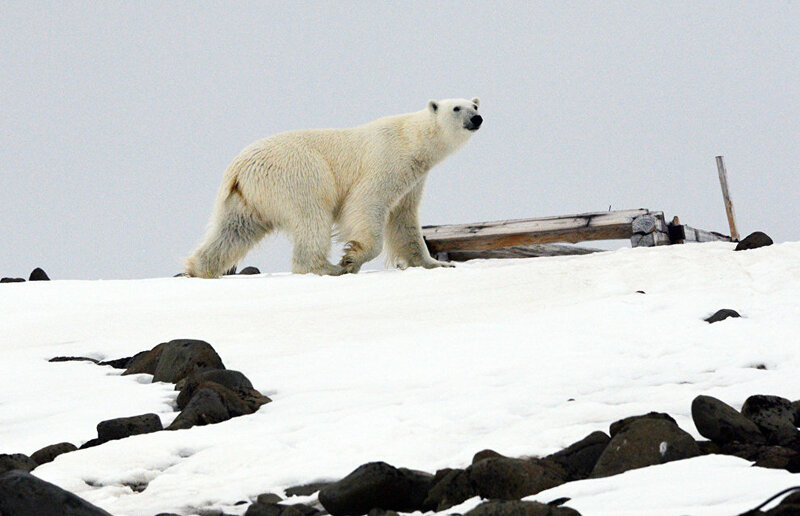 As many as 52 polar bears were seen entering the village of Belushya Guba. There have been cases of bears attacking people and entering houses and public buildings. "Everybody knew this could happen. The number of polar bears is increasing due to a long-term lack of ice. They come ashore and enter human settlements, especially if there is no proper waste management," Stishov said. The expert added that the local government had anticipated that this situation might arise and had asked experts for recommendations. "We can't give recommendations remotely, but we were unable to gain the necessary permission to visit this area from the Defense Ministry," Stishov said. According to the expert, it will be difficult to solve the problem. A special group will be formed comprising researchers, representatives of the Russian Federal Service for Supervision of Natural Resources and other specialists. The team will depart for the archipelago on Tuesday. One possible solution would be sedating the bears and relocating them as far from villages as possible. "It is neither easy nor inexpensive to tranquilize and relocate the animals. They have to be relocated quite far away: 20 or 30 kilometers would not be enough as they would return to places with food. It would require a flight of at least 2 to 3 hours to the other side of the island. It would be almost impossible to relocate all 50 bears, only a group of the most active ones. So, with that in mind, experts are departing for Novaya Zemlya with equipment," the expert said.